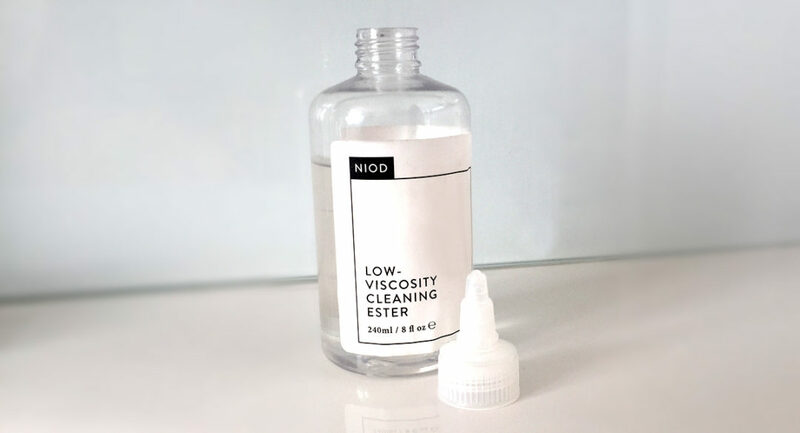 I recently wrote about NIOD, an amazingly advanced and effective skin range. I have used the entire range and am writing about every single product over a series of articles. If you missed the first article about their two incredible core products, view the previous article to take a quick peek. 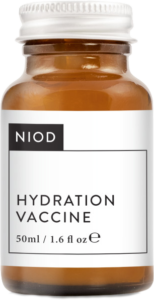 The difference with NIOD is that it really is at the VERY cutting edge of science – they reformulate the products as soon as new generations of ingredients become available so they are the most advanced versions – always. Today I’m looking at three more products that I consider are essential to add to the core products. This colourless thick liquid feels slightly oily but in fact contains no cleansing plant oils at all. It also contains no detergent or water. Instead it uses sugar and avocado esters and removes make up and dirt brilliantly, even round the eyes. The reason it’s made up of these unusual ingredients instead of the usual oils or foaming surfactants, is because it’s designed to clean without damaging the skin’s barrier. It’s a very unusual feel and texture but leaves the skin feeling hydrated and not dry. Another benefit is that the technology behind it, makes your skin able to absorb very effectively whatever is applied afterwards. It can be used with or without water (quite handy on occasion) and is really easy to use. Apply to dry face and rinse or apply to cotton pad and wipe face. Your skin feels incredibly clean afterwards but not stripped of it’s natural oil. Well that’s a name and a half isn’t it? Ascorbic acid is basically vitamin C, here in a pure form. I’m a huge fan of vitamin C for the face having used a powder form previously and getting great results. There are lots of products on the market containing vitamin C but very few are effective due to the fact that it’s extremely difficult to stabilise. As one would expect of such an advanced skin care range, their version is highly concentrated and stable. Added to which, the product contains a number of other highly effective antioxidants (a “network” of niacinamide, vitamin B3, selenium and zinc) making this quite a powerhouse of a product. The benefits of antioxidants both topically and internally are not to be underestimated. One of the biggest causes of ageing (amongst many other unpleasant things) is oxidation. Therefore “anti”oxidants are much needed in our lives. This product fights oxidation, revives skin tone, encourages collagen production and basically keeps the skin in really good nick. It’s only used at night and goes on top of MMHC. 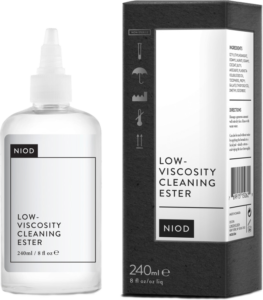 There’s quite a lot of layering with the NIOD products and they all go on top of each other, you just need to make sure you get them in the right order. However, you could also just use the products you like the sound of and layer them with products you already use. In the instructions they tell you exactly how to do that. I love this product and couldn’t actually do without it. It’s meant to complement the two core products CAIS and MMHC. While MMHC hydrates and nourishes your skin, it actually feels like you’ve got nothing on after applying it. Unless you have very oily or young skin, a bit more is needed. This is no normal moisturiser however. It’s full of natural moisturising factors (NMF) in the form of amino acids and..gulp…silicones. I say “gulp” because silicones have a bad name to those of us that like “natural” products. It’s true that most old school silicones are from cheap not very nice sources, whereas these are apparently a whole different ball game. These next generation, expensive silicones actually use the innovative technology to “vaccinate” the skin against moisture loss, apparently the main cause of visible ageing. The build up of the NMF in your skin with the use of the product is designed to make your skin look several years younger (up to 20 they claim!!) after 4 weeks. With all the different stuff I’m using, I reckon I should look about 5 years old by now! All I know is that my skin looks great every time I put this on. Once again it’s got an unusual texture, not oily but quite emollient, without leaving any greasy residue. It literally just slides onto your skin and disappears leaving it smooth and feeling very moisturised. There’ll be at least one more article coming up on NIOD, possibly two. I’m going to cover the whole range so you can find out everything they have to offer. To check out the whole range, go to: Victoria Health.